The Sanctuary Reveals How to Study the Word of God! The sanctuary was an object lesson for the children of Israel to learn more about God. It was not just for them - it was for all mankind! On the Sanctuary Pictures page that led you to this page, you saw a little about how the layout of the furniture shows the form of the cross. The sanctuary is also a picture of Christ. You can also check out some more aspects of the Human Temple here. 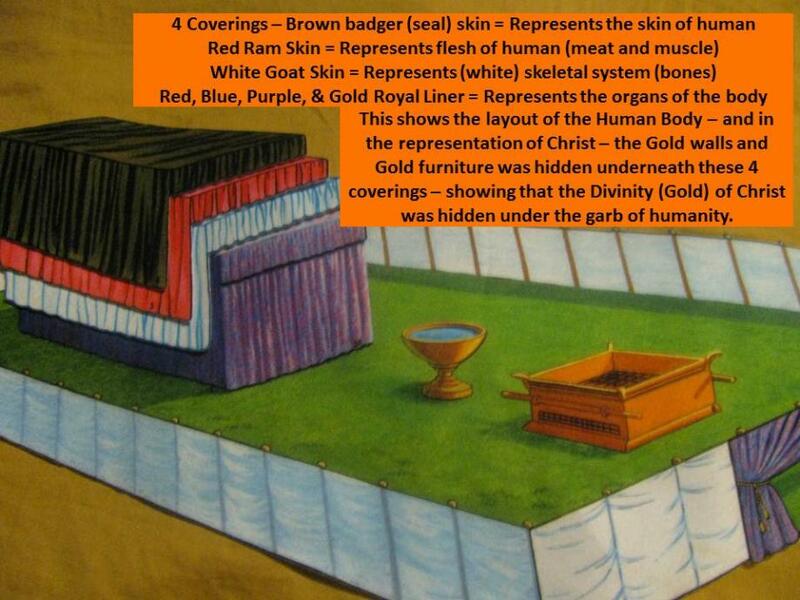 Now this shows one way that the tabernacle represents Christ. But there is so much more! 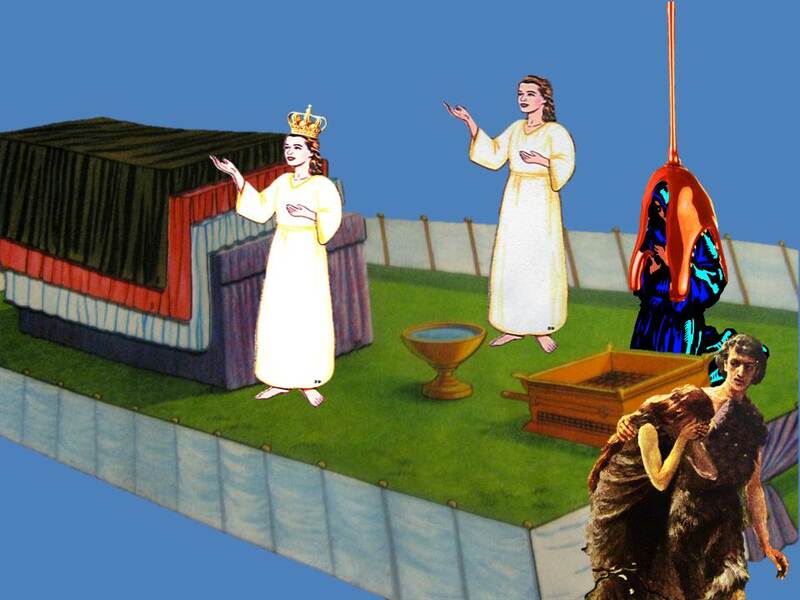 The 4 layers also show the 4 garments that Christ gives to His people. The brown outer layer shows the animal skins that He clothed Adam and Eve with when they fell into sin. The red ram skin shows the covering of His blood that He covers us with. The white goat skin shows His robe of righteousness that He gives us to wear. And the royal liner shows the royal robe of light that we will wear in heaven. If you look at the tabernacle, in light of it representing Christ, and remember that Christ is the "Word," you can also see how the tabernacle represents the Word of God. The Bible gives us the revelation of many truths. It is made up of several layers. The brown outer covering represents the surface truth in the Bible. The plain, ordinary words, that anyone who can read can understand. This is the only layer that infidels and skeptics ever see. The red ram skin represents the plan of salvation, the sacrifice of Christ for the sins of the world. In order for a person to truly understand this layer, they have to go deeper than just the surface words. 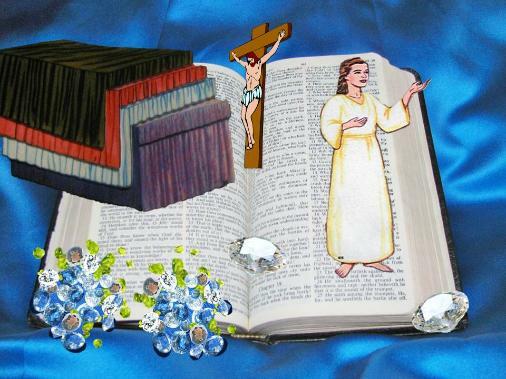 The white goat skin represents the change that takes place as you go deeper into the Word. It shows the effect that the 2nd layer (Christ's sacrifice) has in your life, and how it changes you more into the image of Christ. The royal liner represents the beauty and wonder found as you go deeper into the Word of God. And below this layer, is hidden all the treasures of truth in the Word (gold). These are the treasures that will only be found by those who search for truth as for hidden treasure! If you go into the tabernacle, you find the Table of Shewbread. Here is a wonderful illustration of how we are to study the Bible! There are 2 identical stacks of 6 loaves each. Christ is the "Word," and Christ is also called the "Bread of Life." Each loaf can represent a precept - so you have "precept upon precept"
The loaves are across from each other - so you have "line upon line." There are 2 stacks - so that can represent "here a little & there a little." It also represents the Old and New Testaments. The bread forms the foundation and support for the frankincense on the top. Frankincense represents, among other things, our faith. This way of studying the Bible, is what forms the foundation of our faith!